Note: Data Profiling is not available if your adapter is not configured correctly. For more information about configuring the adapter, see Accessing Data and Creating Synonyms. For alphanumeric columns, Data Profiling provides the segment, format, count of distinct values, total count, patterns count, maximum, minimum, average length, minimum and maximum values, and number of nulls. Patterns count shows the number of patterns found in each alphanumeric column. For numeric columns, Data Profiling provides the segment, format, count of distinct values, total count, maximum, minimum, average values, and number of nulls. The Synonym Editor opens to the Field View tab. 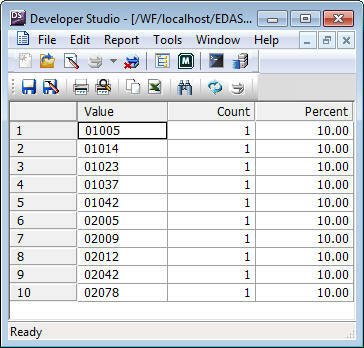 Right-click the synonym or segment name and select Data Profiling, and then select either Statistics, Count, Key Analysis, Values, or Duplicate Values, as shown in the following image. The Data Profiling information displays in the workspace. The image below is an example of an address column. For pattern analysis, a 9 represents a digit, an A represents any uppercase letter, and an a represents any lowercase letter. All printable special characters are represented by themselves, and unprintable characters are represented by an X. Statistics. Shows the same information as a Data Profile report for a synonym or segment. For alphanumeric columns, the Statistics report provides the segment, format, count of distinct values, total count, patterns count, maximum, minimum, average length, minimum and maximum values, and number of nulls. For numeric columns, the Statistics report provides the segment, format, count of distinct values, total count, maximum, minimum, average values, and number of nulls. Patterns. Only available for alphanumeric columns. This shows patterns of letters, digits, and special characters, as well as counts and their percents. Values. Shows unique values and their percents. Hex View. Shows Hexadecimal value of the selected field. Values Graph. Displays a graph for alphanumeric field types. Values Pie Graph. Displays a pie graph. Duplicate Values. Shows identical values. Outliers. Shows the ten highest and lowest distinct values and their counts. These reports are available by right-clicking a column in the Synonym Editor and selecting Data Profiling, as shown in the following image. Right-click a column and select Statistics from the Data Profiling context menu. The Statistical Data Profiling information displays in the workspace, as shown in the following image. Data Profile Patterns shows patterns of letters, digits, and special characters, as well as counts and their percentages. Right-click a column and select Patterns from the Data Profiling context menu. The Patterns Data Profiling information displays in the workspace. Optionally, you can click a pattern count to display the actual patterns. Data Profile Values shows unique values. Right-click a column and select Values from the Data Profiling context menu. The Values Data Profiling information displays. Right-click a column and select Values Graph from the Data Profiling context menu. The Values Graph Data Profiling information displays. Data Profile Duplicate Values shows identical values. 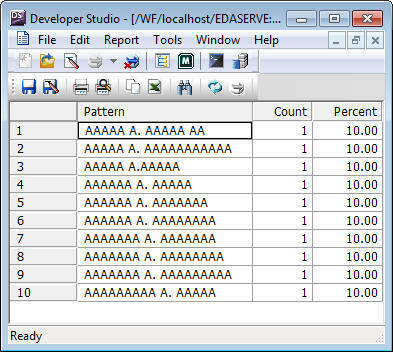 Right-click a column and select Duplicate Values from the Data Profiling submenu. The Duplicate Values Data Profiling information displays. Data Profile Outliers shows the 10 highest and 10 lowest distinct values. Right-click a column and select Outliers from the Data Profiling context menu. The Outliers Data Profiling information displays. Note: Outliers produce a maximum of 10 highest and 10 lowest distinct values, if they exist.